Hyundai Verna. Photo: Sanjay K Sharma Three of the country's top four car makers – Maruti Suzuki, Hyundai, and Honda – are in a race for the numero uno position in the mid-size sedan market. This race was limited to Maruti and Honda for the past couple of years but now Hyundai too has joined the fight with the launch of its new Verna. The new Verna, launched after a full model change in the second half of August, has managed to post a good set of numbers, with total bookings of 20,000 units. That has also helped the Korean car maker dispatch more Vernas in both September and October compared to rivals Maruti Suzuki Ciaz and Honda City. 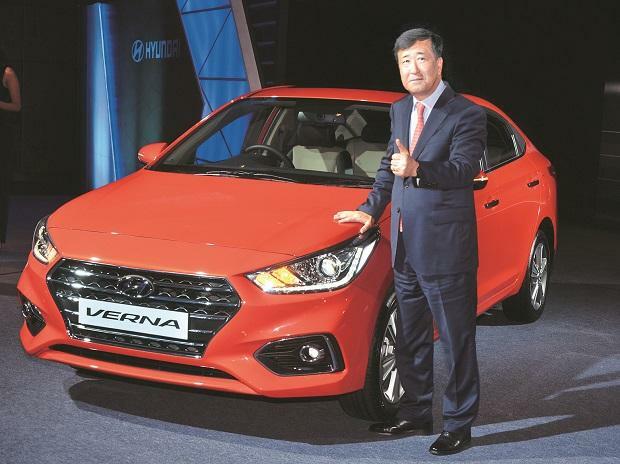 Verna, according to Hyundai, was a segment leader for three years after the company introduced the fluidic model in mid-2011. The Honda City happened to be its key competition. Maruti entered this space in October 2014 with the Ciaz, while its earlier product in the segment, Baleno, had a limited success. Hyundai sold 6,054 units of the new Verna in September against 6,010 units of the City and 5,603 units of the Ciaz. Last month, it dispatched 4,701 vehicles against City's 4,366 units and 4,107 units of Ciaz. That makes Hyundai a segment leader at least for the past two months. Verna has a waiting period of two months as of now. The new Verna boasts of features like front ventilated seats (a segment-first feature) for keeping seats cool in hot weather, smart trunk (also a segment-first feature) that automatically unlocks and pops-out when the owner stands behind the vehicle with smart key and the electrically-controlled sunroof. Hyundai also said the domestic mid-size sedan segment has expanded to 20,000 units a month from 15,000 earlier with the entry of the new Verna. Rivals, however, think it is too early to conclude whether Hyundai has become the segment leader as new products create traction. While acknowledging the rising competition, they doubt if this trend will sustain for a longer period. "The competition is surely going up with new models in the segment. However, City continues to excite the imagination of customers and offers them unmatched value. Since the launch of the new City in February, the sales have been very strong and we are confident that it will continue to do excellent sales this year," said Yoichiro Ueno, President & CEO, Honda Cars India. The City was overtaken by Ciaz, which emerged as the top player in the mid-size sedan market in FY17. During the previous financial year, City's sales declined to 57,984 units (compared to 77,548 units in FY16) while Ciaz sales expanded from 54,233 units to 64,448 units. Ueno says City's competitor model (Ciaz) had a price advantage due to mild hybrid offering in diesel variant. "After the GST (goods and services tax) implementation, the tax rates have come closer for both the cars making the diesel City competitively priced once again," he said. Prior to GST, the diesel variant formed 70 per cent of Ciaz sales as the diesel hybrid attracted tax incentives. The situation has reversed now and the petrol variant forms 70 per cent of Ciaz sales. Ciaz operates in a price range of Rs 7.76 lakh to Rs 10.56 lakh for petrol while the diesel variant ranges between Rs 9.42 lakh and Rs 11.44 lakh (ex-showroom Delhi). Verna has a price range of Rs 8 lakh to Rs 11.35 lakh for the petrol engine and the diesel models are priced between Rs 9.43 lakh and Rs 12.88 lakh (Delhi). City's petrol variant begins at Rs 8.58 lakh and goes up to Rs 13.57 lakh and the diesel range is between Rs 10.84 lakh and Rs 13.62 lakh.